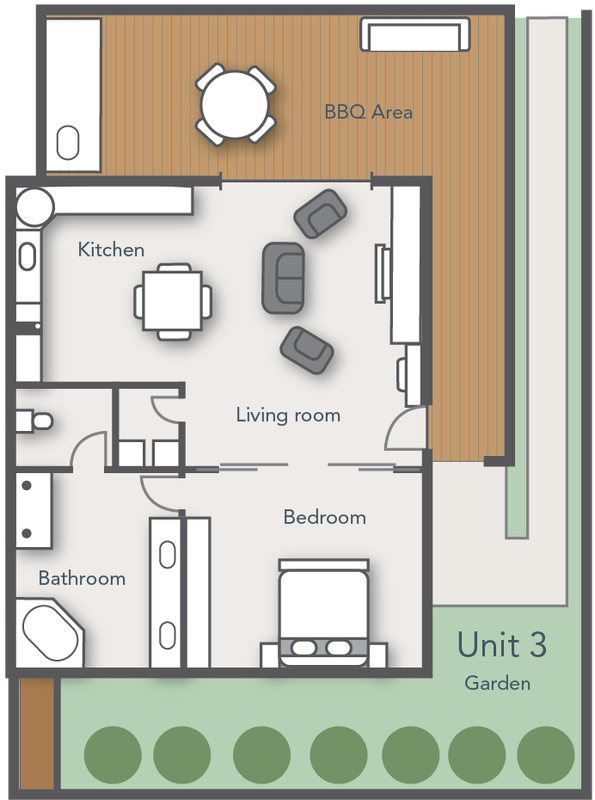 With 150 square metres of floor space, our deluxe apartment is more spacious in all rooms. A stylish and contemporary kitchen has a larger dining table with four chairs, making it perfect for having guests around. This apartment sleeps a maximum of 2 people. Another difference in this apartment is the super king bed in this apartment can be converted into 2 king single beds upon request. The outdoor area is a private enclosed deck area with outdoor entertaining facilities, an outdoor lounge setting and a garden towards the back of the property. There’s a cosy little walkway through the garden leading to a secluded spot with a bench seat that’s a perfect place to rest in the dappled afternoon sunshine, read a book, meditate or simply enjoy the gardens.